May 2007 - No other sportbike in recent history has been awaited and heralded with so much participation as the new 4th generation Ducati 1098 Superbike. It’s predecessor the 3rd generation 999 Superbike was a marginal success in the showroom because of its plain ugly looks only a mother (or a Ducatisti) could love, and it’s high cost. But it was also an unqualified success on the World Superbike circuit where it claimed 2 World Championship titles with James Toseland and Troy Bayliss during its 4-year appearance. 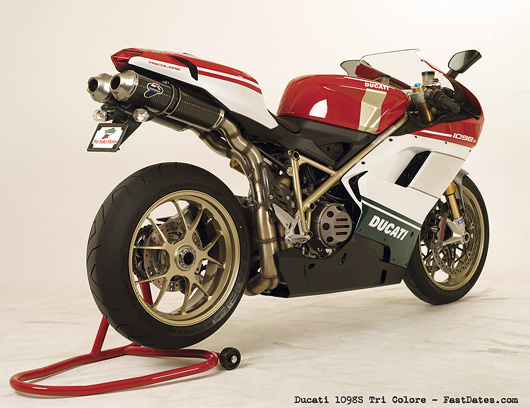 The prior 2nd generation Ducati Superbike the 916/996/998 designed by Massimo Tamburini was the finest Ducati Superbike, ever, and possibly the best ever, having claimed 6 World titles in its 10 year reign. It went out a winner in its final year of production in 2003 with Neil Hodgson clinching its final title. But it didn’t fade away like an old soldier, and in 2004 went on to embarrass the Ducati factory Corse team with their new 999F04s as privateer Frankie Chili continued to win races like at Monza on the old 998 over the factory team. The 2nd Generation Ducati Superbike didn’t need to go, it was still the best superbike in the world, but Ducati figured after 10 years it needed a ground-up redesign, when slight a cosmetic change might have proved better. With the introduction of the all new 999 gone was the beloved single-sided swingarm, the stomach jamming humped back fuel tank, and the quick steering yet steady 1425mm/56.1in wheelbase chassis. The 3rd Generation Ducati 999 Superbike was a much more comfortable bike with it’s lower gas tank hump, a 20mm lower seat height, and a more stable chassis on a slightly shorter wheelbase 1410mm / 55.9in. But it wasn’t as nimble as it predecessor and didn’t turn as quickly, possibly because of a slight shift in mass and a different swingarm length increased from 470mm /18.5in on the 998 to 495mm/19.5in on the 999 and now carried over to the new 4th Generation 1098. The 3rd Generation 999 may not be the best handing Ducati Superbike ever compared to its predecessor, and as evidenced by Troy Bayliss’ death defying high speed headshakes on the 999F07 at this year’s Monza World Superbike race, but it the hands of the world’s top race team and riders any less than major faults can be overcome by unseen geometry changes and rider ability. I’d like to preface this feature article on the new generation 1098 Ducati Superbike by letting my readers know that I have ridden, raced and owned every generation Ducati Superbike made, and that I still ride regularly my modified 2nd and 3rd Generation 998R and 999R Superbikes, so I certainly know the evolution and can accurately evaluate the differences between the Generations. In fact, I don’t even know of any other motorcycle journalist in the world who even owns a Ducati. The 1098 Tri Color being evaluated here is my own personal bike as Ducati NA doesn’t feel a web based publication like FastDates.com with 250,000 monthly readers is as deserving to be invited to new bike launches as a print publications like Roadracing World with just 16,000 reader circulation, or Cycle News with 26,000 readers and most of those are industry or dirt bike riders. Go figure. I actually didn’t want to buy a 1098 Tri Colore when the new 4th Generation bikes were revealed, because as always we know with Ducati, a bigger, badder and better R-model is about a year away. But when I visited my local dealer Pro Italia, Glendale, CA, back in February for the 1098 Open House it seems all his red 1098 base and 1098S models were sold out for 2007, my Desmosedici RR was still almost a year away, and with FGSports’ indecision to finalize the 1200cc V-Twin rules for World Superbike, a new and bigger 1198R was over a year away as well. There was only one Tri Colore left if I wanted it, this special edition would never be built again and I was Jonesing for a new Ducati, so I said, “What the Hell.” And 3 months later in April it arrived with my name on it. So what is so special about the Tri Colore, which retails for $24,950? Well, besides the marginally attractive Italian nation color paint job with it’s nauseating gold paint bar on each side of the gas tank, not much. It is the same as a the 1098S model at $19.950 which is upgraded with full Ohlins suspension from the $1495 base 1098 Superbike. But what you do it in the shipping container to go with it is the beautiful 62/70mm Termignoni full race exhaust with carbon fiber silencers, and a recalibrated CPU module to readjust the fuel curve with it. 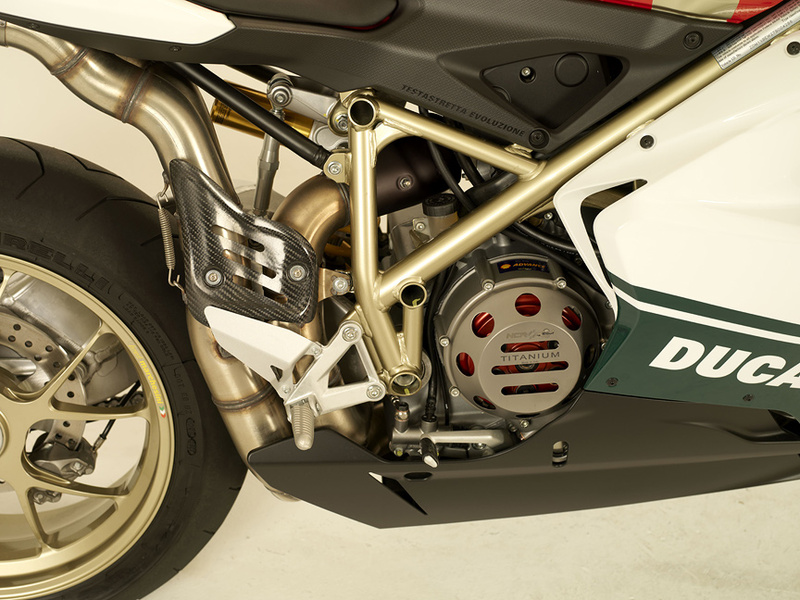 This Termigoni Full Race System for the 1098 is available separately from Ducati Performance for just $2,600, down a full $1,000 from the $3,600 I had to spend on the 58mm Termignoni Race System for my 999R three years ago, which then came without a race system. According to Ducati this new system is good for a 20 pound weight drop and an 8% power increase on the 1098’s rated 160hp, so now it should be pumping out 172.8hp which is more on par with this season’s Japanese liter bikes And overall bike weight is now down close to 400lbs, significantly lighter than the 443 lbs. dry which Sportrider weighed in the new Suzuki GSXR1000 in their July 2007 issue shootout. I’d like to tell you I tested and dynoed the stock 1098 exhaust system against the Termignoni Race System, but I didn’t. I had the race pipe put on the Tri Colore before it even left the dealer (they did it complimentary with the bike sale, otherwise it’s a 6 hour job at home!). Never to use was the stock exhaust system which very surprisingly comes with a Japanese style exhaust valve in the system's mid section powered by a computer controlled and very heavy servomotor with cables. It is very strange that Ducati never even mentions this new servo controlled exhaust valve in any of their press materials or sales brochure for the 1098, which makes one wonder if it even offers an advantage, especially on a big displacement twin. It is depressing though, to have to throw away a brand new, very expensive computer controlled stock exhaust system that is probably needed on the bike but for EPA certification to sell. But if the stock system was left off the bike it could have dropped the exorbitant price of the Tri Colore by a good $2,000, or could have included a Slipper Clutch for the same price. The optional Ducati Performace Slipper Clutch is a must have, is a full 2-pounds lighter with the carbon fiber clutch pack, pulls like butter and lets the engine rev quicker. Note the stupid "S" curve in the rear header pipe to keep it away from the side panel plastic! I also preordered and had waiting a Ducati Performance Slipper Clutch with their new Carbon Fiber Clutch Pack which is 2 lbs. of reciprocating mass lighter than a stock steel clutch pack. I don’t think a modern Superbike can be ridden aggressively without a slipper clutch, and a slipper clutch hardly costs more to manufacturer on a CMC machine, so it is really inexcusable that Ducati still does not offer a slipper clutch as standard on all their performance bikes, especially the top of the line Tri Colore. From a design standpoint the new 1098 and the Tri Colore special edition are a thing of sheer beauty. This is definitely the most beautiful sportbike on the market, finally a very worth replacement for the 2nd generation machine, and only closely rivaled by the MV Agusta F4. As I have been working on my bike I am amazed by all the time and effort the Ducati design department has spent on the bike, its component fit and finish. To the eye it is perfect. New Details abound everywhere, and most have gone unnoticed so far. Like the fact the fuel tank is now plastic like on the Multistrada, not steel as in all previous Ducati Superbikes. Also gone are the Ducati trademark quick release Dzus faster for the fairing and bodywork, replaced now by a multiple number of possibly more attractive miniature hex wrench screws, but which are extremely time consuming to locate and undo. And don’t look in the Ducati Tool Kit located in the lockable compartment in the tail section for the different hex keys needed to remove the fairing or adjust the bike’s suspension. They aren’t there. All you will find in the factory tool kit is a screwdriver, while there are no screwdriver fittings anywhere on the bike! Need to jump-start your dead battery on the street, adjust the suspension or check the engine oil? You’ll need to call a tow truck. Stupid. Which brings up one of my biggest gripes with the design of the new1088. The designers were so obsessed with the cosmetics; they forgot someone might need to work on the bike. 30 minutes to get off and on the fairing, 3o minutes to get at and adjust the front fork tube height in the triple clamps. Rear shock rebound damping adjustment requires removing the left foot peg assembly to slip an hex wrench through a hole in the swingarm. And you want to remove the rear shock to change the spring? – Which is what you will need to do…. Give yourself a good 5 hours to jack the bike up and hang it from the ceiling of your garage, then remove the rear sub frame and body work, silencers, remove the sprockets or/cut the drive chain and remove the rear swingarm. Clearance is restricted by a scant 0.5 inches to unbolt the top rocker arm linkage and pull the shock out of the swingarm. The Ohlins equipped 1098S bikes comes way over sprung on the back shock with a 24/80kg - 450lb spring. My body weight is 220lbs / 245lbs with full riding gear so I am no lightweight and I ride really hard in he mountains around Los Angles and get airborne over jumps, and I still can’t get the back suspension to hardly move. And the preload is set correctly with 30% sag / 1.5 inches for the 5 inches of rear travel. Motorcyclist Magazine also noted this in their May 2007 issuer comparison between a 1088S and a 999S. And the new 1088 with more power was a full 1-second slower around their test track at Button Willow Raceway than with the old 999S. For comparison, the 999R I also own runs a much lighter Ohlins 19/70kg – 400lb spring, while the suspension linkage lengths / ratios look to be similar. Just the fact the 1088 is a 40-pound lighter bike than the 999R means it probably should be running a lighter 375lb spring! I am in the process now of buying, installing and testing lighter rear springs on the 1098, but with all the work it takes to pull the rear shock and having done it once already, I am not too excited to get it done quickly, particular since my older 2nd and 3rd Generation Bikes are much easier to ride. The front end seems to be a little over sprung as well, but not as bad as the rear. I can’t get full compression of the Ohlin’s forks and have an indicated 1-inch travel unused of the 5-inches available. I’ll still in the process of backing off on the spring preload and compression damping to see how that helps, but there are other variables involved with forks like the oil fill which can affect spring rates. The 1098S suffers from more handling problems than being over sprung, a problem which can be corrected. It wasn’t until after I took deliver of my 1098 and was riding it home from the dealer that I noticed it turned like a truck. So once I got the Tri Colore back home in my garage I went straight to performing the regular ritual for Ducati Superbikes ridden aggressively, that of turning back the adjustable steering head angle from the delivered 24.5-degrees rake for highway cruising to 23.5 degrees for quicker handling in the canyons where I ride, and for race track use. The Ducati factory race team has always run all their bikes at the steeper 23.5-degree steering angle. To my shock and dismay the famous Ducati adjustable steering head was gone! Deleted, I guess, by the bean counters in an effort to lower the bike’s cost. So, did the 1098’s designers set the fixed steering head at 23.5 degrees like the World Superbike winning Ducati factory bikes, and Suzuki’s GSXR1000? No. Did they set it at 24.0 degrees like all of Ducati’s slower steering streetbikes the Monster, Multistrada, the ST3 Tourer? No. They kicked it to the full 24.5 degrees of rake to make this supposed responsive handling Superbike the slowest turning bike in the entire Ducati product line. That beautiful Ohlins steering damper on the front triple clamps isn’t even needed with this slow a steering angle, it’s just along for the ride. They should have let it off and given us a slipper clutch instead. We've got the triple clamps down to the 4th grove on the frok tubes in an attemp tp get the bike to turn, but now the riding position is so uncomfotable we don't enjoy riding it. The tachomenter is difficult to read at speed and has no redline indicator. Now you can attempt to quicken up the steering angle some by dropping the front end in the triple clamps which I did. I am running my fork tubes down at the 4th indicator mark from the top and the bike does turn a little better, but still not enough. And this in turn compounds another problem, that of the bike already pitching you so far forward with all your weight on your forearms, making it more difficult to ride the bike and control it easily. To get the bike to turn you have to make it even less comfortable and controllable to ride fast. And it the tight corners you do not stand a chance. In the July 2007 Sport Rider again. where they test the 1098 against the Japanese liter bikes a use a data logger to record the times/speed through the different corners around the track, the 1088 is the slowest bike of all 5 bikes in nearly every corner, and 0.5 seconds off the pace of the next slowest Jap bike. Just as Motorcyclist found the month before, the 1088 does not handle as well and turns slower lap times than the outgoing 999 Superbike. We should also mention here that the new 1088 chassis has a significantly higher rider’s seat height at 820mm/ 32.2ins, compared to 8000mm/31.5ins for the older 998, and a really low 780mm/30.7ins for the 999 where you can sit down in the bike and really feel part of it and control it better. The 1088’s wheelbase at 1430mm/56.3in is half an inch longer than the 999. The two strongest points of the 1088 is its engine and its brakes. Despite the new increased displacement of the Testastretta 4-valve V-twin, rather than vibrating more, it actually feels and revs much smoother, almost like and inline-4, but of course with all that legendary Ducati torque that makes the Ducati engine out favorite power plant in the world. The engine also revs noticeably quicker than the old 999 mill, certainly due to the fact the engine and its’ internal rotating parts were lightened some 10 pounds despite the increased bore and stroke and all new cylinders and heads to accommodate the bigger capacity. And remember, we also lightened the Ducati Performance Slipper Clutch with the 2-poundless carbon fiber clutch pack, protected from road rash by a half-pound lighter NCR Titanium Clutch Cover. And also we added the DP 520 Chain Kit with lighter alloy sprockets, dropping another significant 3 pounds from rotating and unsprung weight. The DP 520 kit lowers the gearing by 1-tooth at both the front (14T) and rear sprockets (39T), to improve acceleration even more. But we are happy to report the new 1088 is the first Ducati Superbike to finally come stock with the correct gearing for real world riding (15T/48T), and is no longerbe way over from the factory. The front brakes on all models of the 1088 are the full-on Superbike spec Brembo monoblock brakes and they are nothing short of incredible. They are one finger brakes at any speed, but be careful at lower speeds as they do grab quickly and will have you pitched through the windscreen, or just loosing to much speed before you realize it and nearly parked in a corner. There are many high superlatives and a few low disappointments on this bike whereever you look. The welcome return to the much-loved single sided sided swingarm, both for looks and easy wheel and sprocket changes. There are a lot of great componentsincluding the extremely lightweight forged gold anodized Marzocchi race wheels with great Pirelli Dragon Supercosa Pro tires. Disapointing is the new MotoGP inspired digital instrument panel with a bar graph tachometer that is impossible to read at speed and has no redline, or when the sun is shining on it. We'd rather have the old round analog guages that are easier toread, But this is the first time a Ducati speedometer tells you your real speed, rather than reading 10% higher as in the past, to keep you from speeding, allowing us to make our own decissions of how fst we want to ride. To a useless computer monitor hookup for the track that tells you throttle position in relation to lap times, but no suspension monitor or traction control. So what you have here is an all new bike that is significantly lighter, but is also bigger, taller, more uncomfortable, and harder to turn. Despite a great engine and brakes, it is not an enjoyable, easy or fast bike to ride like the previous 2nd and 3rd Generation Ducati Superbikes. What does Ducati need to do to fix the glaring faults of the 1098 and get it back on track? 1. Go back to the adjustable 23.5/24.5-degree rake steering head as stock. 2. Get the spring rates right. 3. Lower the seat height by at least 1-inch so you can sit down in the bike more, get some weight off your arms so you can ride the bike more comfortably and controllably on and off the track. 4. Give us the Slipper Clutch a high performance superbike like this needs, a clutch which doesn’t cost that much more to manufacturer and should be on this bike stock, at any price, and particularly on a bike that costs 2.5 times more than a Suzuki GSXR1000 which has a slipper clutch and a 23.5 degree steering angle. It will be interesting to see if the new Ducati 1198R Superbike when it is announced this fall, will have all these issues corrected. But this year with every 1098 already pre sold before it hit the dealers' showrooms, Ducati doesn’t have much motivation to improve a sales winner. But if you are waiting to get a 4th generation Ducati Superbike model, wait a little longer until they get it really right. The Testastretta Evoluzione engine is the crowning glory of Ducati’s development and perfection of the L-Twin engine. World Superbike dominance for the last 15 years is the result of continual commitment to twin-cylinder technology and the 1098 Testastretta Evoluzione, the most powerful twin-cylinder production engine in history, is a fitting reward to our engineers’ continued ingenuity. The 1098 engine is immediately recognisable by its completely new compact cylinders and cylinder heads. Other 1098 innovations and revisions are less obvious as they reside inside the Evoluzione’s engine cases, but whether external or internal, every new development was conceived to create a lighter, more efficient, more powerful and ultra-compact engine for the new generation of Ducati Superbikes. The 1098 capacity is a result of a significant increase in the bore and stroke of the Evoluzione motor. Highly ‘over-square’, it now sports a big 104mm bore and a relatively short 64.7mm stroke. To optimise the benefits of the new, big Ducati Twin, the cylinder heads have been completely redesigned and, when combined with advanced MotoGP induction technology, enable even the standard specification 1098 to produce more power than the previous extreme Testastretta ‘R’ engine. The Evoluzione features a reduction in the angle between intake and exhaust valves allowing highly efficient, straight intake ducts and newly shaped combustion chambers that contain racing size ‘R’ valves (42mm inlet, 34mm exhaust), operated by radical ‘R’ derived camshafts. The new cylinder heads also benefit from fewer components and include magnesium covers to achieve a staggering weight-saving of over 3kg (6.5+lbs). After optimising the Evoluzione cylinder heads, engineers then focussed upon releasing the potential of the new design by feeding them with MotoGP-derived elliptical throttle bodies. With a 30% increase in air flow over conventional throttle bodies, the new elliptical shape contributes an incredible 5hp increase to the record-breaking motor. 1098 owners will be the first to feel the power of this MotoGP technology on the road. The Testastretta Evoluzione is the lightest Ducati Superbike engine ever, thanks to close scrutiny of every engine component. A total of 5kg (11.1lbs) has been saved by reducing the weight of many components, including transmission gears and the gear selector drum as well as the oil pump and primary gears. The Testastretta Evoluzione’s increase in power is protected by a highly efficient oil cooler with increased surface area and an advanced coolant radiator assisted by lightweight, high flow electric fan assemblies. The compact and intricate design of the cooling system integrates perfectly with the 1098’s wind-cheating aerodynamics and sleek lines. Finally, the 1098 is complemented by an all-new exhaust system. Significantly lighter, it has been engineered with a power-increasing symmetrical 2-1-2 layout that uses 52mm-57mm diameter tubing with wall thickness reduced by 30% to 0.8mm (.030in). The system terminates with Ducati’s trademark twin under-seat silencers, delivering that unmistakable signature sound of the big bore 90° L-Twin. The 1098 chassis and suspension have received the same detailed study and performance first priority approach. The goal was to achieve considerable weight saving while building-in strength and rigidity to manage the new high-powered Testastretta Evoluzione engine. Each and every component not only contributes to achieving superior road holding and stability, but when assembled, become a system with value far greater than the sum of all its parts. Developed in cooperation with Ducati Corse, the 1098 Trellis frame has been designed with a simplified tube layout featuring main section tubes increased in diameter from 28mm to 34mm, while being reduced in thickness from 2mm to 1.5mm. The result is a 14% increase in rigidity and a weight saving of 1.5kg (3.3lbs). Our engineers were encouraged to re-think the construction technique of the 1098’s unique single-sided swingarm. The solution was to produce the main operational components using individual aluminium castings so as to ensure strength around the pivot points, wheel hub and suspension links, with fabricated aluminium sections used to complete the construction into a single, beautifully engineered component. Highlighting the way in which individual components are influenced by each other, the new lightweight Trellis frame and single-sided swingarm have enabled a more compact and further weight-saving rear suspension linkage system that features separate lower pick-up points for the push-rod and suspension unit. This ‘tandem’ design effectively reduces stress around the linkage pick-up area of the Trellis frame. Working together with this highly efficient linkage is a fully adjustable Showa single shock for the 1098 and an incredible Öhlins shock for the 1098 S. A vitally important feature of the 1098’s rear suspension system is the ability to adjust rear ride height independent of spring pre-load and other suspension settings, critical when seeking the perfect set-up for personal riding style or track conditions. The fully adjustable 43mm Showa forks with a special low friction Titanium Oxide-treated sliders on the 1098, and spectacular 43mm Öhlins with low friction Titanium Nitride sliders on the 1098 S, both feature radial Monobloc caliper mountings. 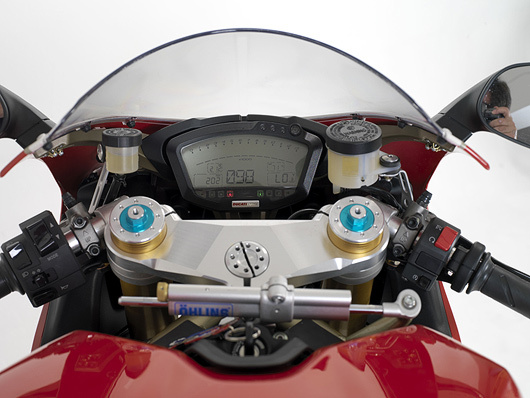 The unique look of these mountings further underlines the no-compromise racing specification of the 1098. Both front suspension solutions are professionally track-tuned and offer superior road holding, deliver superior feedback, and help every rider to be more confident and in control. With a Superbike as capable as the 1098, superior stopping power is fundamental. The 1098 is the first production street bike to use Brembo’s Monobloc caliper racing technology. The M4-34 calipers are machined from a single piece of alloy, vs. the bolt-together construction of conventional calipers. The Monobloc design has much higher rigidity and resistance to distortion during extreme braking, and therefore gives a much more precise feel at the brake lever. The 1098 also introduces for the first time on a Ducati, big 330mm discs which, when matched to the Monobloc calipers, achieve spectacular braking power. Despite the larger diameter, their weight has not increased due to the use of racing-style narrow braking surfaces. The use of Monobloc technology combined with the legendary stability of Ducati’s Trellis frame and the 1098’s overall weight savings has made world championship level brake performance available for the road. The weight saving of 250g achieved on the front wheel substantially reduces the moment of inertia and enhances the 1098’s change of direction and braking performance. The rear wheel is just as impressive with a complete redesign for its single-sided swingarm application that has resulted in a reduction of over 1kg compared with traditional Ducati single-sided swingarm fitments. Both the 1098 and 1098 S benefit from the lightweight Marchesini Y-shaped spoke wheels, but the ‘S’ goes even further by using machine finished forged-aluminium, a special process normally reserved for the production of race wheels. Another first for Ducati is the mounting of 190/55 rear tyres, our widest ever, and the new standard for traction and control. Exploiting every opportunity to reduce weight where possible, engineers chose to produce the front subframe in magnesium. While its construction ensures secure, rigid support for the headlamp, instruments and fairing, the weight-saving around this high, forward position contributes considerably to overall ‘feel’ and control of the machine. Carefully designed not only for aerodynamic efficiency but also to hug the sleek lines of the chassis, the 1098 enables the rider to blend effortlessly into the race-oriented riding position. Great care has been taken in the design of the air supply ducts so to ensure efficient air-flow through radiator and oil coolers as well as provide ample air delivery to the airbox feeding the powerful new Testastretta Evoluzione engine. Moulded in lightweight Terblend®, the bodywork’s form becomes a considerable contributing factor to the overall performance of the machine by helping reduce weight even further while allowing the rider to effortlessly ‘tuck in’ from the wind stream and turbulence to achieve maximum straight-line track speed. Our test bike and all the 2007 Ducati 1098S models come equipped with Ohlins suspension are coming delivered with a way too stiff a marked 24/80 Kg Rear Spring which is a converted rate at 450lbs. I don't know if the bike is set up like this stiff for carrying a passenger or what (It does comes with passenger pegs and rear seat pillion. which we removed from the bike before riding it.) but this is a single purpose Superbike for track and sport riding, not a touring bike! A call to Ducati NA president Michael Locke and I was told the bike was purfect as delivered and I should to learn to ride it as it was. The Ducati North American distributor knew more then me, though they were not involved in setting up the bike at the fsctory. I didn't bother telling them that I had 2 AMA National Superbike titles to my credit, designing and setting up the suspensions for teams Yoshimura Suzuki, Kawasaki and Honda back in the 1980s. After ordering and testing different rate rear springs on the 1098S I found that a 425lb rear spring works best for my somewhat heavy 220 lb body weight and 25 pounds of riding gear / 255lbs total riding weight! If your body weight is under 200 lbs, anywhere from 160-190 lbs, you should go with an even lighter 400lb rear spring. • Lower the front triple clamps down to the 3rd or 4th indicator grooves on the fork tubes to reduce steering angle/rake and help the bike steer quicker. I end up going to my favorite source for motorcycle suspension springs and tuning, Jim Linderman at Lindermann Engineering Race Suspension. • Clearange between the spring preload collar and the shock resevoir body is very tight when the collar is unscrewed to remove the spring and reduce preload. Once you manage to get the spring off the shock with a huge prybar screwdriver and vice and a friend to help pull out the collar, you should use a flat file to gain a little more clearace with the shock resevoir to be able to back off the prelad adjuster as far down on the threaded shock body as possible. You will need all this clearance to set the bike's preload / ride height, and make it easier to get the new spring back on. • The Rear Shock is a real hassle to get off the Ducai 1098 to change the spring. The bike needs to have its rear end suspended from a hoist or robe ot tie-doens anchored to the ceiling of the shop, becasuse your hace to remove the rear wheel and swingarm., and it can't be supported by a rear stand. If you have a front wheel lock stand, you can also use a hydraulic jack under the engine on the sump case to get the back end off the ground. The first time I tried it I removed the entire rear sub frame and bodywork, rear exhaust system and swingarm, and cut the drive chain to get at the shock assembly and it took 5 hours. The next time I tried it by just lifting up the rear of the bike and removing the rear wheel and swingarm. The chain does not need to be cut, just loosen the chain cam adjustmet all the way on the rear sprocket so the chain can be pulled off the rearsprocket. With the full race Termignoni exhaust system installed, the swingarm can not be removed from the bike, but with the swimagrm pivot bolt removed you can drop down and pull back the swingarm about 2 inches, just enough to jiggle and fiddle the loosened shock assembly out from inside the bike. You must support the swingarm with blocks and be very careful it does not bend or damage the exhaust system tubes as it will be resting right up against it to gain the nexessary clearance to remove and reinstall the shcok assembly. I wish you as much fun as we had in changing the 1098S rear shock spring!